It is the first week of 2014 and the capacity of government to deliver its ambitious Agenda for Prosperity, has been severely damaged by another volcanic eruption within State House. Barely three days after president Koroma thought he had firmly laid down the gauntlet and read the Riot Act to his political inner circle, ministers, and the nation as a whole, then came his worst nightmare – the battle for State House being played out on the ‘world wide web’. A journalist – not any old journalist, but one of the ruling APC party’s most formidable and virulent media handlers – David Tam Baryoh was arrested and remanded at the country’s notorious Criminal Investigations Department on Thursday, sending shock waves across the country and abroad. Tam Baryoh is the journalist believed to have contributed immensely to the downfall of the SLPP government in 2007, as well as in preventing the party from retaking State House at the polls in 2012. He is an APC establishment boy turned ‘bad’, according to allies of president Koroma. But in the bosom of the opposition SLPP and those highly critical of the government, David Tam Baryoh is unlikely to find sympathy. Since the establishment of his radio station with the support of the international community after the war, Tam Baryoh has made a profession out of his so called ‘monologue programme’. He has been accused by the Opposition political parties of successfully using his radio station to malign and discredit critics of the APC government and those with whom he disagrees. When president Koroma spoke on New Year’s Day, asserting his resolution for the New Year – in a manner reminiscent of the former president Siaka Stevens, there was a sense of foreboding that all was not well at State House. “We shall engage more to build networks of monitors all over the country; we shall engage more to strengthen law and order everywhere; we shall engage more to sustain our culture of tolerance, to entrench civility, and to bolster effective implementation of the Agenda for Prosperity. “But we shall allow no one to stand in the way to achieving the goals for which we have been elected into governance. We will build upon networks of goodwill, but we will dismantle networks of indiscipline and lawlessness. Is there a connection between that statement and the Tam Baryoh (Photo) affair? By arresting Baryoh, is the president dismantling Sam Sumana’s “network of indiscipline and lawlessness”? Although Koroma’s ministers have been at each other’s throat for over a year, it is the worsening relationship between himself and vice president Sam Sumana that has evoked deep resentment and anger between the two most senior statesmen. So what has that got to do with David Tam Bayoh’s arrest and detention? And why was Tam Baryoh arrested? In order to understand the nature and causes of most interpersonal-politico conflicts in Sierra Leone, one must always firstly scratch the tribal surface. And very often, there lies the answer. But the Tam Baryoh affair is more complex, although tribalism cannot be excluded from the mix. He hails from the Kono tribe, to which the vice president Sam Sumana also belongs. President Koroma and most of his key allies in his inner circle are either of the Temne or Limba/Loko tribes – to which the majority of those who voted for the ruling APC party belong. And to add to the complexity of the tribal factor is the fact that president Koroma’s wife is also of Kono origin. It is a political fact that no party can win a general election in Sierra Leone without winning the majority of votes in the Kono district. And this is what makes the Kono tribe a formidable force for political parties to reckon with. So when president Koroma decided to contest the presidential election in 2007, he knew that his running mate must hail from Kono, although his choice of Sam Sumana who was not a political household name came as a big surprise. 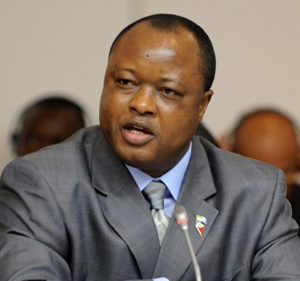 But Sam Sumana (Photo) had plenty of cash, which he has been accused of amassing after defrauding two businessmen in the US, to buy his way, right to the top of APC politics to become Koroma’s presidential election running mate. The 2007 presidential and general elections were won by APC and Sam Sumana was appointed vice president. But the honeymoon did not last. There was no love lost between Koroma and Sam Sumana. The marriage of convenience had to end. And when that end came, it was very bitter and acrimonious. The vice president’s term in office has been plagued by one scandal after another, including serious allegations of corruption, graft and abuse of office. And when former American business associates of Sam Sumana accused him of defrauding them of thousands of dollars, president Koroma chose to give him the benefit of doubt and looked the other way. Many believe that the money allegedly stolen from the Americans was used in helping to pay for Koroma’s electoral victory in 2007. 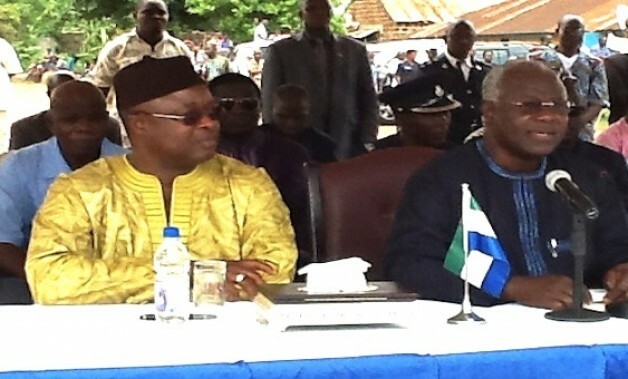 But when the vice president became embroiled in what was dubbed by the Sierra Leone Telegraph as ‘Timbergate’ – the illegal granting of export permission in exchange for cash – caught on camera by undercover reporters working for Al Jazeera Television, Koroma could no longer be seen to be overtly supporting his scandal prone vice president. The US Senate had called for an investigation into the Timbergate affair. The police investigation into the Timbergate affair was a whitewash – a paper exercise conducted to placate the US Senators. The police declared that no charges will be brought against the vice president. No evidence was produced in support of allegations that he had committed wrong doing, despite breaking a national moratorium banning the export of timber. Sources close to State House say that president Koroma was fully aware of the vice president’s shady dealings, but lacked the moral courage to hold Sam Sumana accountable. Sam Sumana is believed to be privy to information regarding the corrupt behaviour of everyone involved in the government. He is not expected to go quietly if pushed under a bus by the president. And Sam Sumana is not without his allies, one of which is David Tam Baryoh. In the last few months Baryoh has been accused by allies of Koroma, of negative media briefing against the government on behalf of the vice president. 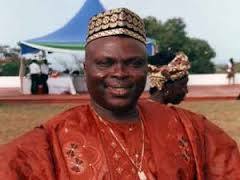 David Tam Baryoh is also being accused by State House of being an opposition SLPP mole. According to State House sources, this accusation and suspicion has not only taken a life of its own, but has further widened the gulf between the president and the vice president, which analysts predict will destroy the ruling APC party, before the next general elections in 2017/2018. It is understood that president koroma’s battle is now being fought on his behalf, by his minister of transport and the ruling party’s national electoral campaign chairman – Logus Balogun Koroma (Photo), who himself is of Kono origin. So why was Tam Baryoh arrested and detained? “On January 2, 2014, at 10:00am, I got information that senior police personnel of the Criminal Investigations Department in Freetown were looking for me. Surprised that I was being ‘wanted’ for doing no wrong, I went to the CID with my assistant, Mr. Silas Gbandia. Upon arrival, Senior Police and head of the CID, Mr. Koroma said I was needed to make statement on an allegation of defamatory libel complaint brought against me by Mr. Balogun Logus Koroma, Minister for Transport and Aviation. Minister Koroma said in his statement to the police a day earlier that I had sent him a text message through his cellular phone asking whether it was true that he had told a lady friend of his that he, (the minister) was threatening to “deal” with me. In my four-hour (sixteen-page) statement to the police, I answered in the affirmative-that indeed I had sent such text to the minister with a view to clarify if the claim was true that he was angry with me for, among other things as alleged by my informant, interviewing on my radio program, too many high brow opposition politicians of the Sierra Leone People’s Party, SLPP. I also told the police that I had said to Mr. Logus Koroma in my text message that his threat was coming at a time when some people in high places were threatening to burn down my radio station. Reading through his statement, the police posed several questions to me. I told the police, in my statement, that I thought that the government of Sierra Leone was a UNITY and that the issue of camp did not exist. I also told the police that I never accused the minister of planning to burn down my radio station and that he may have misunderstood my text. Several portions of Mr.Balogun Logus Koroma’s statement to the police were read to me so that I can adequately respond to the allegations of defamatory libel based on the text I sent him. To the best of my knowledge and based on the truth I know about the entire issue, I responded to the questions posed to me by the police to the best of my satisfaction; explaining how he, the minister had even sent me two text messages denying that he was behind any plan to “deal” with me. After my interview at 6:00pm, the police told me that they had orders from above to confiscate my phones and detain me. I was detained until 12:56am of January 3, 2014. While being released, the police also told me that I was equally being investigated for seditious libel. The chief police officer of the CID said that I have not fully cooperated with his men during investigations but that they will call me when they need me. Police also asked me for documents which they think I have that borders on state security. I told them I could not produce what I did not have, and that the question that I had been given sensitive state security documents by a faceless person, does not even arise. 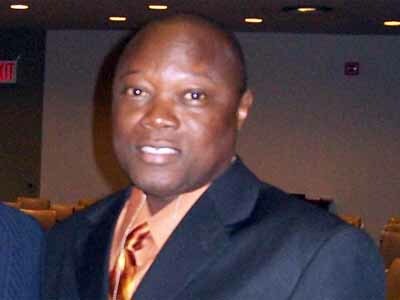 Generally speaking, I am hurt, feels disadvantaged and unfairly treated by both the police and Minister Balogun Koroma. I have neither committed defamatory nor seditious libel against Minister Balogun Logus Koroma and the state of Sierra Leone respectively, and so should not have been detained in the first place. I deserve an apology from Minister Balogun Koroma and I advise that the police should be fair, continue to be professional in their performance, especially in dealing with journalists being reported by politicians. May I categorically state that my detention was precipitated by Minister Balogun Logus Koroma’s unnecessary and incorrect interpretation of my genuine text of concern for my personal security, as well as the extraordinary exuberance of the Sierra Leone police to satisfy politicians; hope my case will be the last among many of such situations where people’s freedoms are haphazardly treated by the police, with careless abandon. I take this opportunity to thank all my professional colleagues, friends, relatives, compatriots and the diplomatic community for standing by me at these trying times. The struggle for freedom and true democracy should motivate us all!! Baryoh: Mr. Balogu Logus Koroma, i just heard from a lady friend of urs that u plan to ‘deal’ with me because, according to u, i am an slpp and dat i am pretending. Ur reason is dat i always interview more slpp people on my program. My brother, walls have ears. Ur threat is coming at a time that a few people in high places are mechanising plans to burn down my station. Well, i may be unassumingly helpless, but i am not without terrible info on such and many other plans. Am shocked at ur new plans against me. However, i am at liberty to trust our mutual friend, d president, 4 my security. By copy of this text he is duly informed. Thanks. Dr. Tam Baryoh. Balogun Koroma: Brother Dave Tam Bayoh, I am surprised at your unfounded allegations . Apart from the fact that you are my Kono brother, as A.P.C. Elections Coordinator for the 2012 elections in which my President and party emerged victorious in the 1st round; you aired all my interviews from every part of the country and gave me air time on your popular programme whenever i needed it. I expect you to do the same for me in 2017/18, so why should I have anything against you. Your information is far from the truth; in fact FALSE. Who is this lady friend who gave you such false info that you have not in your trade mark style tried to corroborate? Please continue to be professional: you are, and will remain my friend and brother. As advised by you, I have also copied my response to H.E. the President, my Boss. I will call you later today. Balogun Koroma: My brother David, as indicated in my earlier text message, I wanted to call and have a one on one meeting with you with a view to understanding where you are coming from by associating me with people you claim are planning to “burn your radio station”. However, I understand you are with the Hon. Vice President in Kono, and on your return, taking into consideration the seriousness of your allegation, I want you to corroborate it by calling forward the so called Lady friend of mine who told you that; I am sure she is alive and you can bring her name forward. You have always been a professional journalist and I am sure you want to maintain that position; except if you have an agenda against me by making such wild allegations. This latest episode of government anarchy and ministerial mutiny has not only further damaged the country’s image, but raises serious question about the level of maturity of those governing Sierra Leone today. 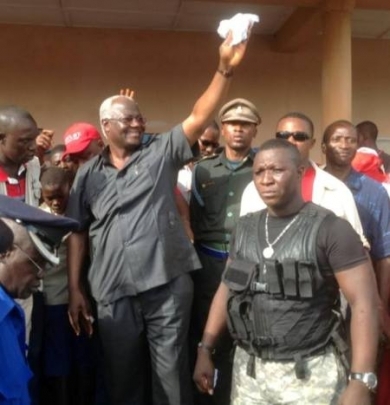 President koroma has finally lost control of his government.